Posted by admin in Africa, NASA Earth Observatory, Ol Doinyo Lengai, Tanzania. 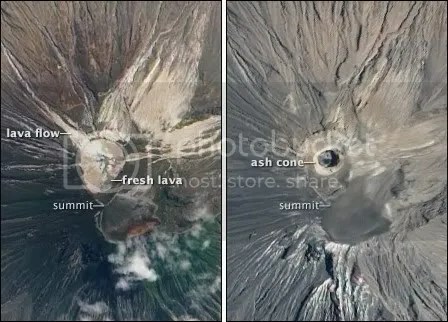 The NASA Earth Observatory has just published some particularly fascinating volcano imagery in its ‘natural hazards’ category: satellite images of the remarkable Tanzanian volcano Ol Doinyo Lengai, showing the changes that have occurred at the summit of the volcano following the explosive eruptions of 2007-8. The Earth Observatory has showcased two images, one from July 2004 (detail on the left, above) and the other from September 2009 (on the right). Ol Doinyo Lengai is unique on Earth because of its low-temperature natrocarbonatite lavas. Posted by admin in Africa, current research, geoscience, Hawaii, Kilauea, Ol Doinyo Lengai, Pacific, submarine volcanism, Tanzania, United States. Various interesting bits and pieces of volcano-related research to report. Apologies for the lack of detail, but I’m pressed for time right now. Ash evidence suggests impact of past eruptions underrated – a research team from the University of Oxford has studied the distribution of ash from the Chaitén eruption and concluded that the impact of past volcanic eruptions is likely to have been significantly underestimated, because so much ashfall is light (a few millimetres thickness) and is quickly lost from the areas affected. More on this at Science Daily, under the snappy headline Chaitén Volcano In Southern Chile: Historic Volcanic Eruptions Significantly Underestimated, Ash Fallout Analysis Shows. Origins of Ol Doinyo Lengai’s weird lavas probed – the unique carbonatite lavas of Ol Doinyo Lengai volcano in Tanzania are produced by a very low degree of partial melting of the upper mantle minerals, concludes research to be published shortly in Nature by U.S. and French scientists. Science magazine’s ScienceNOW (caps lock stuck down?) news service also has an article on this, bafflingly entitled Volcanic Fish Out of Water. Thriving ecosystem supported by NW-Rota 1 – scientists who have just returned from filming and studying the deep undersea volcano NW-Rota 1 report that the active volcano nourishes a rich and thriving biological community including shrimps, crabs, limpets and barnacles, some of which are new species. National Geographic News has some pictures. Gentle, easy-going Kilauea has a dangerous side – between 1000 and 1600 years ago Kilauea, known today for its gentle tourist-friendly lava flows, chucked rocks 16 or 17 kilometres during powerful explosive eruptions. Posted by admin in Africa, eruptions, natural hazards, Ol Doinyo Lengai, Tanzania. A team from the Volcano Disaster Assistance Program has been hard at work in Tanzania, working with the Geological Survey of Tanzania and the Tanzanian Disaster Management Department to assess the volcanic hazards presented by Ol Doinyo Lengai. This USGS press release tells the story. Ol Doinyo Lengai is currently highly active, and has been having a very disruptive effect on the people who live around it. It is also unmonitored: ‘We usually do not deal with volcanoes that have no monitoring equipment, so this forced us to look at the situation in a new way’ comments project leader Gari Mayberry. ‘We determined that disaster risk reduction education may be the most feasible way to reduce the hazard around Ol Doinyo Lengai in the short term’. Ol Doinyo Lengai is the world’s only carbonate volcano, erupting low-temperature natrocarbonatite lavas. Most of the volcano’s eruptive activity is effusive, but silicate material can find its way into the volcano’s system producing explosive eruptions. Ol Doinyo Lengai has been in an explosive eruptive phase since September 2007. Posted by admin in Africa, eruptions, Ol Doinyo Lengai, Tanzania. 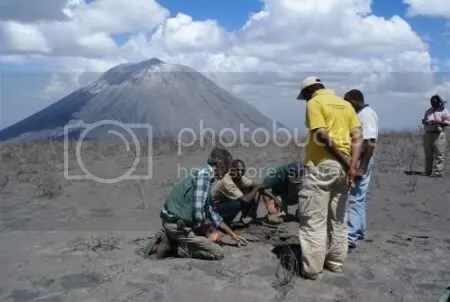 The news that the Evangelical Lutheran Church of Tanzania is to offer 250 tonnes of food aid to people suffering the effects of eruptive activity at Ol Doinyo Lengai volcano in northern Tanzania has drawn my attention to the fact that The Volcanism Blog has so far run no coverage whatsoever of this remarkable and currently active and disruptive African volcano. This report is intended to make some kind of amends for this omission. Eruptive activity at Ol Doinyo Lengai is usually effusive rather than explosive, but at times an increased proportion of silicate materials finds its way into the system and produces periods of explosive eruptions. Such a period of explosive activity has been under way since September 2007. Details of Ol Doinyo Lengai’s eruptive history can be found at the Global Volcanism Program and at the very detailed, informative and richly illustrated Ol Doinyo Lengai site run by Frederick A. Belton of Middle Tennessee State University. The eruptive activity that began in 2007, and which is ongoing, has had a destructive impact on nearby communities. Ash columns have risen to between 3000 and 18300 metres altitude, and heavy ashfall has damaged crops and rendered farms and villages uninhabitable up to a radius of 50km from the volcano, with more than 10,000 people reportedly forced to flee their homes.